No full analogues. See antiviral and immunomodulators . Representing an antiviral agent, hyporamine is used in the complex treatment of diseases caused by the ingress of viruses of different nature. Being a low-toxic drug, hyporamine is rapidly removed from the body and does not adversely affect the human immune system. In addition to these indications, hyporamine is prescribed in the treatment of infections caused by viruses that are sensitive to the active substance of the drug. Since the greatest result in treatment is observed at the start of treatment at the earliest stages of the disease, it is the early diagnosis of the disease that is an important component of its successful treatment. 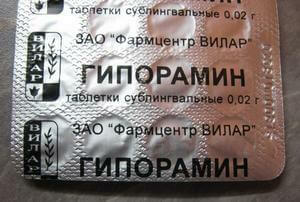 And depending on the type of infection, the doctor prescribes the type of release of this drug. Tablets are usually used in the complex treatment of such types of diseases as adenoviral, influenza and respiratory syncytal types of lesions. Resorption tablets are made before their complete dissolution, with the most complete sanation of the oral cavity. Depending on the age of the patient, the dose of medication is also prescribed: for adults, the permissible dose is 4-7 times per day for a tablet, for children over 12 years old - 4 times a day for a tablet, for children aged 4 to 12 years - 2 times a day 0.5 tablets. 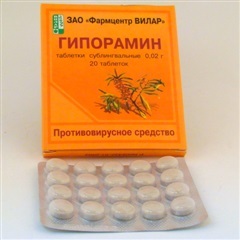 The prophylactic dose is also calculated by the doctor depending on the general condition of the patient: for adults - 3 tablets per day, at the age of more than 12 years - 2 tablets per day, from 4 to 12 years - 2 times a day, 0.5 tablets. The period of use of tablets is with complex treatment for adults - from 3 to 5 days. 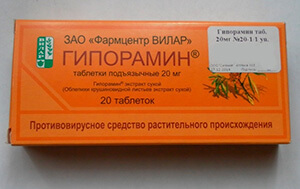 The ointment is used as a local external agent in the treatment of diseases such as shingles, chickenpox, recurrent and acute herpes of various localization. Depending on the degree of damage to the body, the period of use of the ointment is 8-12 days, in some particularly severe cases up to 24 days. 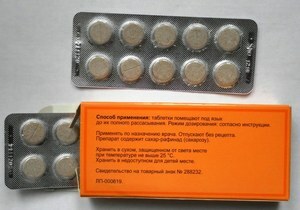 In this case, the simultaneous use of lozenges to help cope with the infection is recommended. Courses of the use of hyporamine ointment may be repeated; Usually, this appointment is made by the attending physician, taking into account the effectiveness of the treatment. The presence of contraindications to the use of this drug causes possible adverse events. The use of hyporamine can cause a number of side effects, which are manifested depending on the type of release of this drug. With prolonged use of hyporamine in any kind of release, irritation of the nasal mucosa is likely. Also note that the use of hyporamine is not recommended in children (up to three years). Since this drug is of low toxicity, the use of hyporamine during pregnancy is acceptable when controlling the woman’s well-being by the attending physician. Rapid elimination of decay products from the body also allows you to prescribe it when breastfeeding: the minimum amount of the active substance passes into breast milk and does not have a pronounced effect on the child's body. Data on overdose of hyporamine was not provided. However, the appointment of this drug is strictly in accordance with the general condition of the patient and the treatment is carried out under the supervision of a physician. The most strictly controlled condition of the patient in the presence of diabetes. 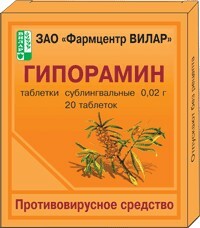 Representing a medicinal product of plant origin, hyporamine in its composition has an extract from the leaves of the sea buckthorn. Influencing the viruses of influenza A and B, as well as all varieties of acute respiratory viral infections, herpes zoster and chicken pox, this drug is rapidly excreted from the body, without causing harm and visible effects on the immune system. However, full control over the impact of all components of the tool is impossible, since the effect of the drug on the human body is complex. And the use of research and the method of markers, as well as bio-research does not provide a complete picture of the effects of the drug. Hyporamine medication should be stored for no more than two years in rooms without high humidity, preferably without exposure to bright light and direct sunlight, in order to preserve its medicinal properties. The air temperature in the room should not exceed 25 ° C, accessibility for children should also be limited. Interactions with other drugs were not observed, a contraindication to the use of this tool can be considered individual intolerance to the components of hyporamine.